This year's winner of the Specialist Wine Merchant of the Year went to Vini Italiani in London, with the runner-up being Wine Pantry. Vini Italiani in London’s South Kensington wins the award this year not just for its outstanding Italian range, but for the wildly enthusiastic way the team promotes la dolce vita through tastings, wine and food events and so much more. An extra 100 wine lines in the past year sees its shelves groan under 600 choices (plus Italian grappas, liqueurs, beers and amari), including 200 products that are imported directly. Some of these wines are chosen via the Vini Italiani ‘tasting committee’, where customers and sommeliers are invited to help select the best. The judges were impressed by the number of events and initiatives to introduce customers to new wines. The ‘fine wine of the month’ has seen a selected wine being offered at close to cost price for a limited period: Tignanello and Col d’Orcia’s Poggio al Vento Brunello have been among those on offer. A monthly Regional Masterclass run by head sommelier Simone Semprini shows seven wines to customers, while the company works with Italian regions and bodies such as the Slow Food movement to bring customers regular wine and food events, competitions and incentives. Online dating site Lovestruck.com is another partner, Vini Italiani’s chairman Matteo Berlucchi having invented a speed-tasting matchmaking format. Visitors to Vini Italiani’s store can experience what the company describes as its ‘part store, part meeting space’, concept with two Enomatic tasting machines, and the Salotto, a tasting corner with sofas and plenty of guide books on hand, as well as the store’s sommeliers. Last year ’s winner Wine Pantry impressed again in 2013. 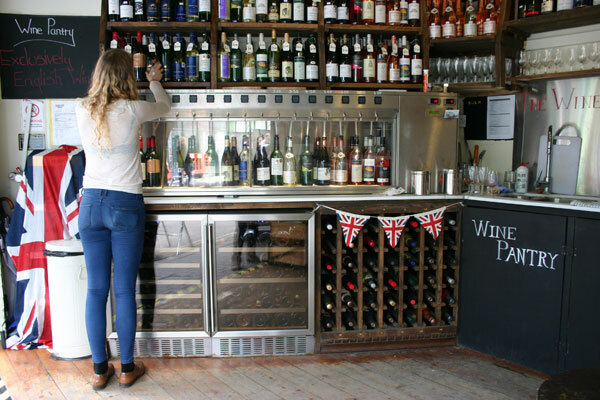 The original, cupboard-sized shop in London’s Borough Market continues to offer a superb range of English wines, and in December 2012 a second, larger branch in St Pancras International station opened. This, and an expanded range (to include English beers and spirits), allowed Wine Pantry to offer larger customer tastings. Shortly before we went to press, Wine Pantry experienced a setback when licensing issues forced it to close the St Pancras site. However, it expects soon to announce an alternative location nearby. In the meantime, the company continues to operate from its base in Borough Market, and is spreading the word by growing its wholesaling business to London’s bars and restaurants too.